Rupert Neve RND 517 500 series Preamp/compressor used in my little home studio. Aside from really digging RND gear, I like the ability to blend Mic/line, the variable Silk feature, and the easy to set compressor, all in one microphone preamp. Geez, I'm kinda making myself want to keep it! 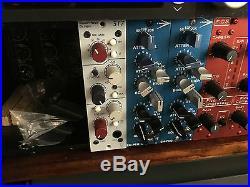 The item "Rupert Neve 517 RND preamp/compressor 500 series" is in sale since Tuesday, January 31, 2017. This item is in the category "Musical Instruments & Gear\Pro Audio Equipment\Preamps & Channel Strips". The seller is "csf6366" and is located in Palo Alto, California. This item can be shipped worldwide.